I had planned to hike Little Santanoni Mountain today (Saturday) if I was able to get an early start. 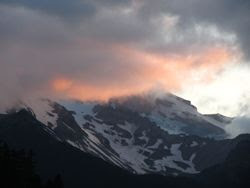 The weather looked great and I wanted to hike this one while there are still a lot of daylight hours. The roundtrip distance is 21 miles so I was planning for an all day hike. I managed to get up and out early and was on the trail at 6:40 with my dog Rev. I brought a bicycle to bike the first 2.3 miles along the carraige road towards the Great Camp Santanoni. This took me 20 minutes and probably saved me 20 minutes each way. The trail to Moose Pond is an old woods road and it is still maintained. In fact DEC has been doing a lot of work on the road adding water bars to divert water. They've also added a few new culvert pipes. This trail is a horse trail and is well suited for that. It is also a good cross country ski route. 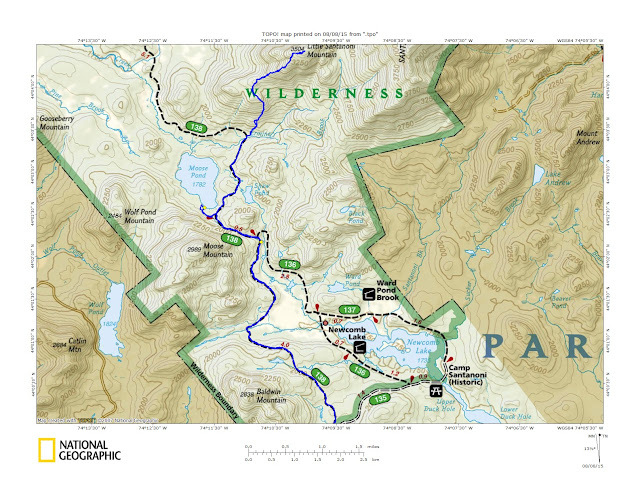 I did a ski to Moose Pond and back last winter. The the woods road in good condition, I made good time getting to Moose Pond, arriving in 1 hour and 40 minutes. This was at the 6.8 mile mark. 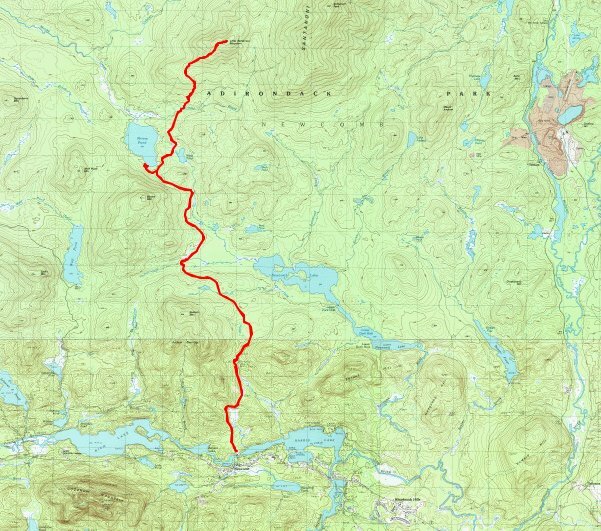 There is a split in the trail at Moose Pond and I turned right to go around the east side of Moose Pond towards Ermine Brook. At 2 hours and 5 minutes, I reached Ermine Brook. Rev took a big drink and then we crossed the brook and turned right into the woods to begin the bushwhack. I had heard that this bushwhack was releatively easy and I was hoping to find that to be the case. It started well with open hardwoods down low. The lower portion of the bushwhack was open hardwoods. As I got up to about 2800', fern waves mixed in with hardwoods and the hiking was still easy. The soft woods finally came into play about 0.3 miles from the summit. Still the hiking was easy. The tree density was light to moderate, even at the summit. I reached the top after 3 hours and 4o mintes; not bad for 10.1 miles. The summit offers no views but I found a small viewpoint looking north. The most interesting feature I could see, was something I call Couchsachraga's Wart (a false summit on the SW side with open rock). I want to visit it sometime! A zoom view of Couchsachraga's Wart. I climbed up this fallen tree and stood on it to take the previous 2 pictures looking north. I let Rev take us back the way we had come. She had no problem doing that by following the scent. We were back at Moose Pond in an hour and 15 minutes. It was still early so we went down to the campsites at Moose Pond to see how they looked in the summertime. As we approached the pond, I could hear a loon out on the water. The way to Moose Pond. A good look at Little Santanoni Mountain. Perhaps I'll go back in the future to climb the slide. 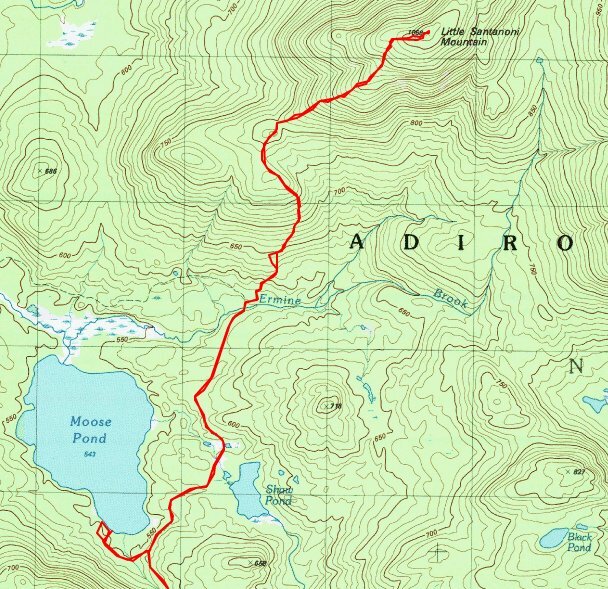 The hike back on the Moose Pond woods road was uneventful. Once back at the carraige back it was time to hop back on the bike and coast downhill (for the most part) back to the car. This was awesome! Rev wasn't so trilled that she had to pick up the pace at this point. The split of Moose Pond trail from the carraige road. Rev trotting to keep up while I rode the bike back. The carraige road is pretty in itself for those who haven't done it.